TRAXX is the next step in 2WD racing. TRAXX has many new features, not seen before in largescale racing. The best options you always wanted are finaly combined in 1 car. Want to run the ultimate dirt set-up, it is possible. Or go for a high grip astro track, no problem. A rigid chassis with a top deck ensures ultimate stiffness and dureability. The philosophy of a non-flex chassis is simple as the shockabsorbers should absorb and do dampening, not the chassis. In the front the top deck is covered by an end plate. Not only does it make your chassis torsion stiff, it supports the top deck and keeps the dirt out. Traxx has a large kick-up of 20 degrees ensuring perfect straigth line stability and huge ability to attack rough bumps ahead. Increased chassis length gives a longer wheel base and with components even more centered, she goes where you aim her at. ? The front-end is a very open, yet simple design. Nevertheless do not be misguided by the optical simplicity. It has every option needed for setting up your car. But... if you want, you can incorperate a little bumpsteer and use it in your advantage. Put the steering plate higher than neutral and you will run the more forgiving mode. Your car than handles the exit of corners on power more easy. Or go the opposite way. Make her turn aggressive by lowering the steering plate and you will squeeze out the last bit of turn in. The steering wipers have been reversed. No more the inner wheel when cornering "to flip-flap free", doing its own thing. No more the inner wheel moving close, or over its dead-point. Instead an even bigger steering angle is now achieved. Though little force is applied on the inner wheel when cornering. It is due to this reversed wiper orientation possible to keep the inner wheel to steer tight and fix in the direction as desired. C-hubs on the front for less play in the steering geometry. Beefy bushings will last and keep your steering system smooth all season round. But foremost, this new set up is chosen to allow loads of extra suspension travel. Extra travel allows the front to keep longer contact with the surface in rough terrain. Steer the car where it needs to go and use the extra suspension travel for ground contact where others will be trying to air steer! Of course you have several suspension hinge points, can play with camber, toe-out and even add a sway bar or front brake if you like. All items and set-up points are easy accesible. With a few screws you have the full front-end unit including the servo saver in your hands. Cleaning, checking or working on it made easy peasy. On the rear the reliable gearing of the MMX has been re-used. Don't change what has proven itself for years and years. Other than that, nothing remained. The dif gear and dif pinion have been re-positioned. It is now all at the very center of the car. This ensures a better optimized position weight wise and minimizes non-centered gyroscopic effects, it further allowed us room to incorporate huge wishbones. And with huge wishbones, huge suspension travel is possible. And to allow huge suspension travel the well known ball-drive needed to go. A full new spline-drive has therefor been developed. Beefy and rock solid CVD conections, together with silky smooth function on the spline connection. Zero binding effect under all angles of +45 to -45 degrees! No more setting your droop limits to prevent wrecked ball drives. Set as much droop as you wish. Facing an all rutted track with holes your car will dissapear into, just bring it on. Finally suspension can do its job as you always wanted to. No holes to deep, no bumps to high. 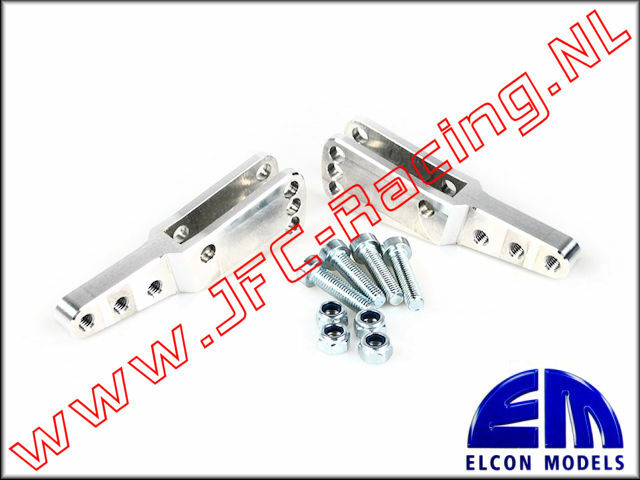 Toe-in can be changed easily with small insert plates, of course all other settings are also adjustable like roll center and camber. Happy times are here to play around with your set-up. All with a quick an easy acces as it is made ultra easy and fast to wrench on. Finaly what you desired for, after many years, is now possible. Without the use of conversion kits. Using the same drive line and same chassis, it is all done and sorted. Just turn the engine quick mount on your engine in the desired position and place/remove the shims in the chassis and you're done, having a full new balanced car! A new car to our logic deserves a new face. And so we came up with a full wind tunnel tested design. With aeroelastic effects on the hood scoop with automated DRS at speeds of above 35km/h while keeping the maximum downforce ....-... NOT! We wish you lots of fun building & racing and hope to meet you on TRAXX! Jan & Onno. Car comes as "roller" building kit. Not included are following (car) parts: isolator, clutch, air filter and adapter, exhaust, engine and electronics. Option parts like air brake, sway bar, extra toe-in inserts or additional progressive springs are not part of the delivery.